Deep within the Pictish swamps which used to surround the fallen kingdom of Avalon, the swamp trolls made a home for themselves. Being mostly solitary individuals, these trolls wait patiently for prey to walk by as they sit in the swamp resembling rotten logs or other kinds of natural waste. When a swamp troll strikes, the transformation from seemingly natural swamp feature to 1000 pounds of determined hunger is so sudden that the victim of the attack must roll for surprise with a -3 penalty. 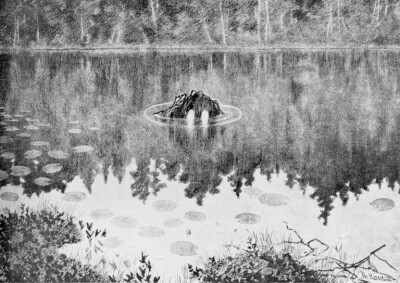 The favourite tactic of swamp trolls is to grab hold of their targets and pull them under water with their hands (which are full of tiny suction cups, causing anyone caught to have to succeed a Bend Bars check in order to free themselves) and either crush them to death or drown them before/while eating them.